This selection shows diverse technical and stylistical aspects of performance. The samples are about 20 sec. each. They have been extracted from live recordings in recitals by Claudio Di Veroli in the 80's and 90's, recently transferred to digital media. The pieces were played on the Hubbard-Di Veroli harpsichord, once considered the best such instrument in South America and still admired today in public recitals in Europe. It is a Taskin replica with a chromatic compass FF-g'" and the classical French two-manual disposition: 8' and 4' on the lower manual, 8' on the upper manual, manual coupler and a buff/harp stop acting on either 8'. 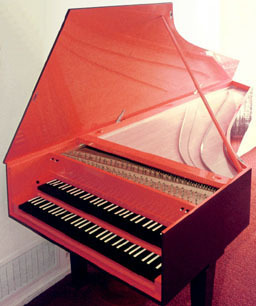 At the time the harpsichord was tuned to A=441 Hz because it was more often than not used with modern instruments. The instrument was later set to A=415 Hz, which improved the sound quality even further. The files below are in Windows Media file format (.WMA). To hear them you need to have installed either Windows Media Player 7+, an MP3 player or a similar freeware utility.